Many of you may remember that that we participated in Giving Tuesday in December of 2015. In one day we raised a little over $1,300 (shout out to YOU! Thanks for supporting us!). We purposed the money for a new fundraising challenge we were dreaming up for our ministry partners. After months of hard work, we have finally launched the very first challenge! Give4Good is a competition between 3 ministry partners, that focuses on receiving votes through one-time $4 (or multiples of $4) donations (we call them "vo-nations!). Whichever ministry receives the most vo-nations will receive all of the money raised by their supporters, PLUS a $1,000 from Perception Funding. The other two competing ministry partners will also receive all of the money raised by their supporters vo-nations. Our goal for this challenge was to broaden our Ministry Partners horizons when it comes to fundraising. Not all fundraising needs to happen in stuffy coffee meetings, or awkward phone calls. This challenge will give our Ministry Partners the courage to introduce their ministry to people they may have not felt comfortable approaching before, since they will simply be asking for a small one time gift. The three Ministry Partners competing in this challenge are all YoungLife areas in the Kansas City area! To find out more (and to cast your vo-nation) please visit the Give4Good webpage! 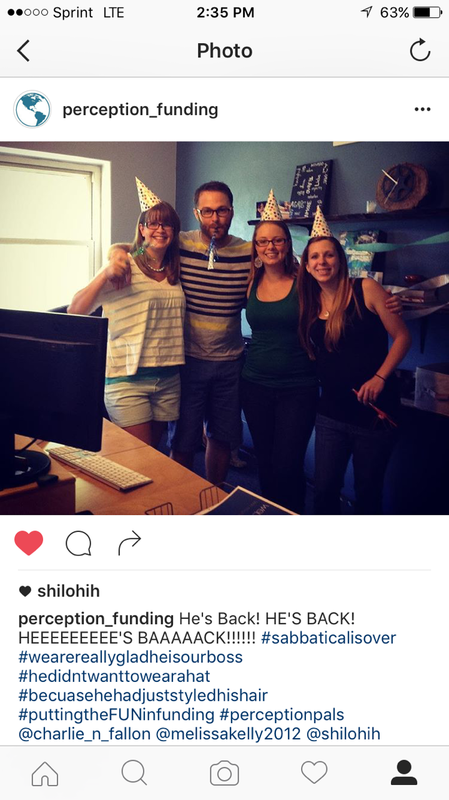 Jonathan is officially back to work after his Sabbatical. We are so glad to have him back, refreshed and reenergized. He is currently sorting through a list of To Dos, scheduling out meeting requests, and planning to spend some time with the staff; sharing his new ideas developed throughout his Sabbatical. In the next month, Jonathan plans to write a special update, detailing what he learned in his time off, as well as explaining how he intentionally spent his time! Stay tuned! Melissa, our Web Developer, and her husband, Corey, are excitedly awaiting the birth of their second child - a little boy! She is due the end of July. Please pray for a healthy few weeks, and for energy - as she chases their 2 year old around! Shilo's (our Communication Coordinator) husband lost his job in May, and is currently doing a phenomenal job as a Stay at Home Dad. Please pray for patience as they search for a new job. They were in the process of buying a home, so they are currenlty waiting to see if that will come to fruition. Pray that Give4Good is successful for all three Minsitry Partners competing. Our Ministry Partner, Hope Albania (Dan & Dawn Hall), just returned to Albania after a couple weeks spent stateside. We are overjoyed that they were able to come home and spend time with family for a little while! Our Ministry Partner, giveDIGNITY (Seth & Andrea Sears), are currently stateside for a Sabbatical. Pray for true rest. They are tired and in need of encouragement and rejuvenation.